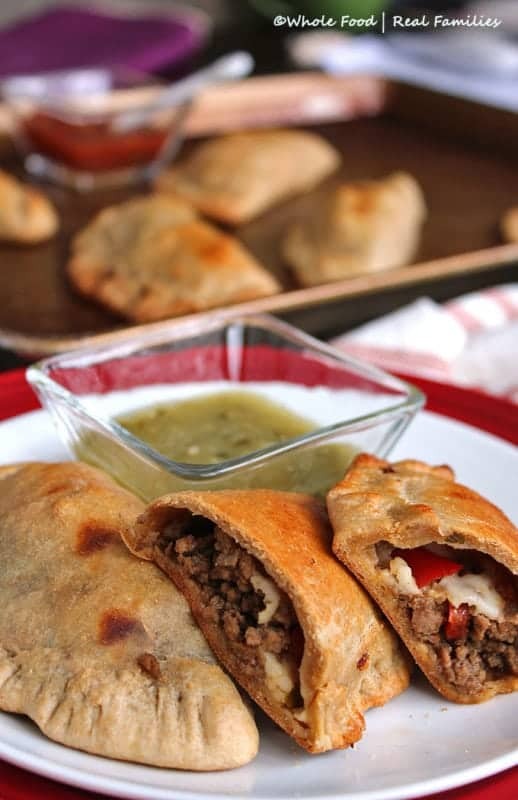 These Easy Beef Empanadas are a family favorite. Eat them with your hands, dip them in your favorite salsa. Don’t forget the sour cream! We love empanadas. We have no heritage that brought them to us or family member that taught us how to make them. Like most of our recipes, we just thought they were delicious and learned to make them. 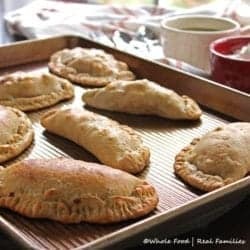 So I am not sure that you could ever call our version authentic – but these Easy Beef Empanadas are simple to make and qualify as fun food for our kids. The whole wheat dough is made in the food processor and just dumped on a lightly floured surface and rolled out. The cutting into circles is fun enough that my kids argue over who gets to do it. Though you can buy a cutter made just for empanadas, we just flip a bowl upside down for perfect circles. We love stuffing empanadas with all sorts of things. Just make sure you cook anything ahead, like meat or veggies that release a lot of water. For example, you would want to cook mushrooms ahead so that they don’t release all of their water inside the sealed dough. That would make a very mushy and unappetizing empanada. Rather than frying our empanadas, we bake them for a healthier option. 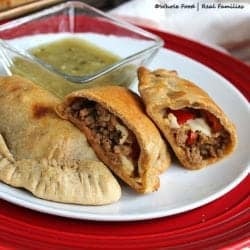 You can use any empanada dough recipe that you like. You can even buy it in most stores. This is our favorite Whole Wheat Empanada Dough. I like to keep it made ahead and frozen for easy weeknight meals. Move it from the freezer to the fridge the night before. Roll it out, stuff it and seal with your favorite goodies the next day. Looking for another dinner recipe? 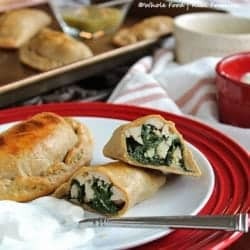 These Whole Wheat Chicken and Kale Empanadas are so good! Turn out Whole Wheat Empanada Dough on a lightly floured surface. Roll the dough until it is very thin, about 1/4 inch. Using a round cutter, or just a bowl tuned upside down, cut the rolled out dough into circles. In a large saute pan, heat olive oil over medium heat. Add minced garlic and cook for 1 minutes stirring constantly. Add the onions and peppers and cook until soft. Add ground beef, cumin, salt and pepper and cook until meat is no longer pink throughout. Drain any excess fat from the beef. Fill half of each dough circle with the beef mixture. Sprinkle grated cheese on each empanada. The amount of mixture you include in each empanada circle will depend on how big you cut each dough piece. Start with a few tablespoons down the center of the circle so that you can fold it over and seal the edges of the dough by pressing the edges with a fork. You can use your fingers to crimp and fold the sealed edges for appearance. If you want the tops of your empanadas to be golden, brush them with a lightly beaten egg. Cook the empanadas on a sheet pan lined with parchment paper for 20 minutes. Serve warm and with your favorite salsa!